Homespun Stitchworks..... For the love of vintage: Do you love English Paper Piecing ?! .. It just got easier. Do you love English Paper Piecing ?! .. It just got easier. We are a small Company based in Devon with a passion for English Paper Piecing - namely Hexagons. We have developed a new method for doing EPP that is quick and easy to use. The unique construction of the templates that we use, instead of paper, means that they are fully washable. The templates are left in to give the fabric a plump, luxurious effect. We have called our templates 'Hexiforms'. Our aim is to introduce English Paper Piecing to a wider sewing audience, people who would like to try EPP but are put off by all the preparation needed for a project the size of a bed quilt. range of projects, for example; pillows and cushions for home décor - bags and purses for every occasion - fun soft balls for all play and wedding ranges and ring pillows. There are kits for Christmas tree decorations too. Full Kits .... Everything is supplied: Hexiforms ( all cut to shape), Fabrics ( all pre-cut hexagons and again cut to shape) Wadding ( not needed in ball kits) quilt panel backing ( for pillow and cushions), freezer paper and full, easily understood instructions. Basic Kits .... Again everything supplied apart from fabrics. The pack contains Hexiforms ( all cut to shape ) wadding (if needed), quilt panel backing ( for pillows and cushions), freezer paper, full and easily understood instructions and a 'Hexagon template sheet' for cutting/quantity information. Whilst talking to Suzi she show me a sample of a cushion .. half made with the paper method and half with Hexiform method. The difference was vast in the fact that the side made of Hexiforms was stiffer and more plump and the one with the traditional method was indeed softer and not as plump. I personally feel both have a place in our stitching depending on the make. That said I would personally use Hexiforms for most of what I stitch. If I wanted some hexagon patchwork on a skirt for example I would use them because they always would look ironed and flat. Suzi told me they are fully washable and do not scrunch up and ball in the wash and they look so clean cut and smooth they are simply amazing! But here is the thing there are not just hexagons of all different sizes there are diamonds, squares, jewels, skinny hexagons and so many more. So let me tell you some prices. 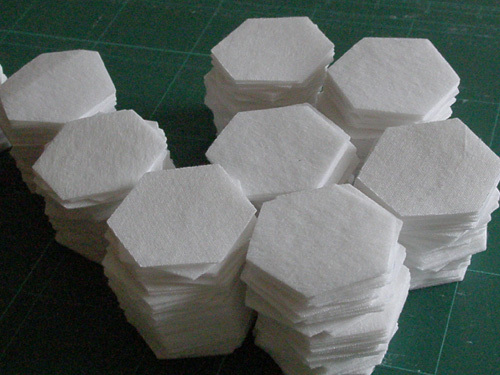 For pre cut hexiform hexagons for a pack size 60. The above is just some of the prices but do get in touch or look on their web page. details to follow. I bought some hexiforms to try and I bought two packs so when I use them I will show you what I have done. It may well be some decoration for that antique linen skirt I bought I have not decided yet but I will be using them and was very taken as to the quality and thought that has gone into this fabulous product. There is so much to say about this product and so many kits or just packs of different shape Hexiforms that I have barely touched on it. So if you are intrigued or would like to buy from Suzi and Colin Argent then here are their contact details for you to do just that. Do get in touch with this lovely couple and see what products would suit you. If you would like to buy just the hexiforms you can or indeed a kit. What a fabulous Christmas gift a kit would make for a stitcher in your life. The bag kit is particularly lovely I think so just get in touch and look on their websites at their fabulous kits with all you need to make, even the fabric. Just had a quick look at the website, going to investigate further! The results were really good Dawn.